Josie Guinn (left) had 24 goals in ’15-’16. There’s a new sheriff in the Southwestern League. For the first time, Vista Murrieta begins the season as league champions. It was a title at least three years in the making, and now the question is ‘What now?’ Temecula Chaparral likes to think it’ll have something to say about it, and both Temecula Valley and Temecula Great Oak are preparing to take that the shine off VM’s new badge. VISTA MURRIETA (19-4-5 overall, 7-1-2 Southwestern) are well placed to do even more this season, which is a lot considering the Broncos allowed just 22 goals in 30 games and won a league title for the first time in ’15-’16. Seniors Josie Guinn and Ashley Johnson are the most potent attacking duo in the Inland Area. The pair have combined for 107 goals in 141 combined varsity games. 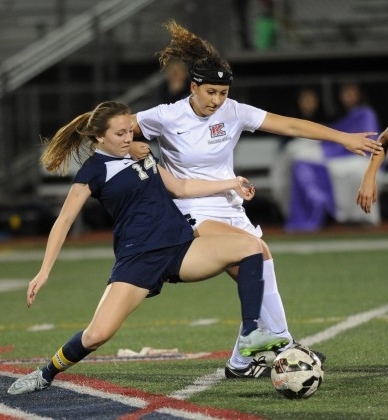 TEMECULA CHAPARRAL (15-6-5, 6-2-2) did a lot of good things last season, and if you ask the Pumas they were probably a little bad luck away from claiming the SWL title for their own. Senior striker Juliette Brown will get plenty of attention from center backs after leading the team with 13 goals. TEMECULA VALLEY (17-5-2, 6-2-2) had an opportunity to grab a share of a league title on the last day of last season but lost, 2-0, to Vista Murrieta, sending the Bears from first to third and a quick exit from the playoffs. Senior midfielder Christine Maurer has attacking talent to work with. TEMECULA GREAT OAK (4-11-5, 1-5-4) missed out on the playoffs for the first time in years, and by a wide margin. MURRIETA VALLEY (4-15-2, 2-7-1) lost seven of their final nine games to end the ’16 SWL campaign. MURRIETA MESA (6-8-4, 1-6-3) scored only 17 goals in 18 games last season. Nov. 29 – Eastvale Roosevelt at Vista Murrieta, 5 p.m.
Dec. 2 – Redlands at Temecula Chaparral, 5:30 p.m.
Dec. 10 – Corona Santiago at Vista Murrieta, 5 p.m.
Jan. 18 – Temecula Chaparral at Vista Murrieta, 5 p.m.
Jan. 20 – Vista Murrieta at Temecula Valley, 5 p.m.